The Portia Simpson-Miller led People’s National Party (PNP) is back in office in Jamaica, having won the December 29 parliamentary election by the impressive margin of 41 seats to 22. Early reports are that nearly one-half of the eligible electors did not vote; and that the PNP secured 53 percent of the popular vote. If these reports are correct, the PNP”s 65 percent of seats in Parliament is based on the votes of only 27 percent of Jamaica’s qualified electors. As some commentators have observed, this points to a substantial ‘participation deficit’ in Jamaica’s governance and ‘confidence deficit’ in Jamaica’s democracy. The new Administration will ignore this only at its peril. 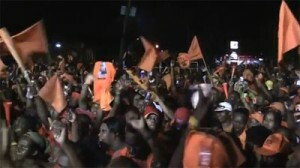 Waving their colours, PNP faithful celebrate their party's victory in Jamaica's general election. The immediate challenge facing the new government is the economy—specifically, the IMF. The latest agreement has been off-track for most of the last year; the government has no choice but to re-establish it in order to access badly needed funds. The room to manoeuvre is limited. A fresh austerity package is a virtual certainty. The IMF will also demand credible assurances on policy and institutional reforms; that went awry under the previous government. The PNP government will strive to extract concessions to soften the blow, notably the jobs programme that was the centrepiece of its election manifesto. But the package as a whole is likely to be deflationary rather than growth-promoting. And getting sustainable growth remains the number one challenge for Jamaica. This will be the litmus test of the government’s economic performance. What about Caricom? The PNP’s victory will probably be welcomed in the region. Traditionally, the PNP is seen as Cari-for; the JLP, as Cari-sceptic. But we need action, not image. On the agenda must be Jamaica’s huge trade deficit with Trinidad and Tobago – a festering sore on the body of Caricom relations. ‘Portia’ and ‘Kamla’ should address this as a matter of priority. Can they succeed where their male counterparts have failed? th Independence anniversary party in August 2012 find British Privy Councillors still sitting in final judgement? After all, she is on record as wanting a Jamaican Queen! And speaking of Queens, when is Jamaica going to get rid of the ridiculous anachronism of having the British monarch as the Jamaican head of state? Does Mrs. Simpson-Miller’s declaration, made in the heat of an election debate, reflect a subconscious desire to be installed as the first President of the Republic of Jamaica; presiding triumphantly over the Independence celebrations? Some would view this is as an unlikely scenario. An Executive Presidency has never been supported by the JLP. And I can’t quite imagine Mrs. Simpson-Miller as a purely ceremonial head, devoid of real power. Besides, ‘Sister P’, as she is affectionately known to her supporters, is already a queen in their eyes. Still, who knows? Any scenario can play! What needs to be changed is the systems and practices that have contributed to our economical ruin over the last 50 years, which has nothing to do with the monarchy.